EDUCATION Bachelor of Science in Respiratory Therapy – Georgia State University in 2006. Juris Doctor – John Marshall Law School in Atlanta, Georgia in 2013. Sharee Tumbling practices primarily in the area of workers’ compensation defense. Sharee is a native Atlantan, she received her Bachelor of Science in Respiratory Therapy from Georgia State University in 2006. 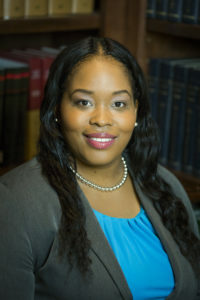 She later received her Juris Doctor from John Marshall Law School in Atlanta, Georgia in 2013. While in Law School, Sharee competed in Moot Court and Negotiation competitions. In 2012, she won the Best Respondent Brief award at the Frederick Douglass Moot Court Competition. She is also a previous GABWA scholar and Gate City Bar Scholar. During Law School, Sharee clerked for the Honorable Judge Kimberly Esmond Adams in Fulton County, Grady Hospital and Forrest B. Johnson & Associates. She was admitted to the Georgia Bar in 2013 and began her legal career as a Plaintiff’s attorney practicing in the areas of medical malpractice, wrongful death and workers’ compensation. Sharee’s career has allowed her to gain litigation and jury trial experience. Prior to joining Moore, Ingram, Johnson & Steele, she worked for an Atlanta defense firm defending general liability and workers compensation claims. She currently lives in Atlanta, Georgia and enjoys traveling, spending time with family and cheering on the Atlanta Falcons.